Leisure and Culture Dundee, Scottish Incorporated Organisation Number SCO42421, trading as Dundee City Box Office is the data controller of your information for the purposes of the Data Protection Act 1998. Please check the effective date each time you use the website as the terms may change. Dundee City Box Office only collects personal information about you (for example your name, address, telephone number, email address and credit card details) when you specifically provide us with such information on a voluntary basis, for example when purchasing or enquiring about event tickets online. Any personal information we collect via our website will never be released or sold to any companies or individuals outside of our authorised partner companies. We will not share your personal information for marketing or any other purposes without your consent unless where required by law. 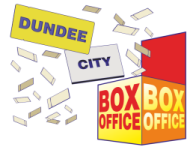 Dundee City Box Office use the information you provide us with to sell you the tickets you requested. We may occasionally use some of the same information (such as the type of tickets you requested) to tailor the content of this site to the interests of our users. By making a purchase from this site you are consenting to your financial and/or personal information being passed to any third party organisations necessary to process your transactions with Dundee City Box Office such as credit card companies, banks and the companies that handle shipping on our behalf. Except for these specific cases, we will never share financial information with third parties without your specific consert. When you are on Dundee City Box Office website You may be asked if You wish to be contacted by carefully selected third parties. If You agree to this, third parties may contact you by post or email with information or offers regarding their goods and services. Dundee City Box Office is not responsible for the privacy policies or practices of any third party sites and consequently we advise you to read their privacy policies before submitting data to such sites. We shall provide You with the ability to edit the information in Your user account that you provided to Dundee City Box Office when registering with Us for the first time by using the personal page configuration area. You may request deletion of Your user account at any time by contacting Us. Content or other data that you may have provided to us and that is not contained within Your user account, such as posts that may appear within any forums that We may set up on this website from time to time, may continue to remain on the website at our discretion even though Your user account is deleted. We will always respect your privacy. You may opt-out of marketing communication by following the unsubscribe instructions provided in the marketing emails.